To celebrate my return home after a third period of hospital stay this year, I thought that in this and the next blog posting we might discuss certain medical terms. The first question is: what English word spelled with final -sc has the c silent? I’d never come across it in writing before, though it’s a word familiar in its spoken form ˈriːsʌs to anyone who watches medical soaps on television. It’s short for resuscitation, the emergency medical process intended to manually preserve intact brain function in a person in cardiac arrest or major trauma until further measures can be taken to restore spontaneous blood circulation and breathing; or the place or unit devoted to this process. But how do we write it? 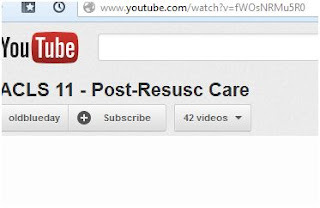 At least some people spell it resusc, derived from the full form resuscitation by simple truncation. I first came across this spelling while browsing through the Oxford Handbook of Clinical Specialities (as one does), though I cannot now find the exact locus again. Here’s another example, from YouTube. The OED, on the other hand, knows only the spellings resus and resuss (and bizarrely considers the word ‘chiefly British’). In other news (“Gategate”)… As journalists have pointed out, conservative whip Andrew Mitchell’s alleged use of the term ‘f***** pleb’ last week to insult the policeman who barred his way outside 10 Downing Street not only betrays his Flashman-like upper-class or public-school (Rugby) background but also attests to his age (if he were younger he’d’ve said ‘chav’ instead) and reveals his rather poor command of Latin (his colleague Boris Johnson, after all, who is a good classicist, would know that plebs is a singular mass noun, and pleb an ignorant back-formation from a word mistakenly taken as including the plural ending, like cherry from cherise or pea from pease). You can draw what conclusions you see fit from the fact that I included an entry for ‘pleb’ as a headword in LPD, with ‘plebs’ in the same entry but also included as a separate headword. I’m under instructions to take things easily for the next four weeks. So I’m going to reduce the frequency of blog postings to just three a week: on Mondays, Wednesdays and Fridays. Well, not so long ago, writing under a crazy pseudonym, I told you to take things easily too, at least as regards my insane comments. If resus(c) is an acceptable abbreviation of resuscitation, the surely pleb is an acceptable abbreviation of plebeian. Actually, I've always supposed that pleb was a facetiously knowing back-formation from plebs. How about another (medical, if one wills!) term muscle? It's not in the same class as resusc (-sc in the end) and definitely much more common, but has the sc pronounced /s/, despite the -le that follows. It's a similar result but arising from two different phenomena. In muscle the C is silent between an S and a vocalic L. This is unusual but comparable to the T in wrestle or apostle (and the C in muscle would also be a voiceless plosive). In resuscitation, on the other hand, the C is soft because it's followed by an I. This gives it the same sound as the preceding S, thereby forming a double consonant, which is pronounced as a single S. This is a completely regular. The irregularity is that when the end of the word, starting with that crucial I, is dropped, the C keeps its "soft" sound. So it's not that the C is irregularly silent, it's more that it's irregularly soft. "In muscle the C is silent between an S and a vocalic L. This is unusual but comparable to the T in wrestle or apostle (and the C in muscle would also be a voiceless plosive)." Then, I suppose the c in muscle was historically pronounced, the same way as the t's in wrestle, apostle or castle, and was eventually lost to facilitate pronunciation - I doubt this theory, however. Rascal, though spelt differently, has the same /skəl/ sound (what muscle should have had) in the end but it failed to evolve into RUSSEL. "In resuscitation, on the other hand, the C is soft because it's followed by an I." That's the obvious bit, but no one thinks resuscitation is strange, anyway. It's the abbreviation 'resusc' that breaks all the rules; but I suppose it's the same way with a lot of other modern shortenings. Just think of veg /vɛdʒ/ for vegetarian. I have not heard this word in America, either on TV or elsewhere; the OED may well be right. I've only encountered "resus". 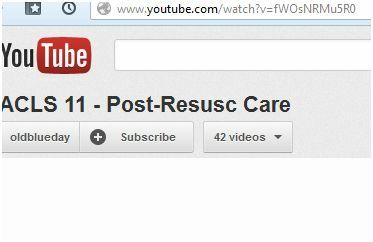 The Resuscitation Council's website is resus.org.uk, and I think this reflects the usual spelling of the abbreviation. 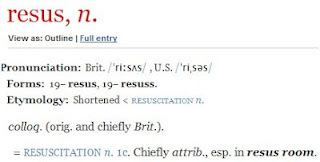 Incidentally (anyone), I've a couple of queries regarding the OED's US pronunciation, /ˈriˌsəs/: how common is a schwa with stress (even if secondary), and would many AmE speakers consistently distinguish resus from Rhesus (OED: "U.S. /ˈrisəs/")? Finally, well done to John for a much better definition than in the OED. Contrast with their "emergency treatment designed to restore circulatory and respiratory function after cardiac arrest, major trauma, etc". CPR does not itself restart the heart, although it does increase the success rate of subsequent defibrillation. My guess (and it is only a guess) is that the OED uses stressed schwa as its US transcription of the STRUT vowel. In this case, I wouldn't be surprised if the OED started with the UK pronunciation and simply "translated" it into US English. The difference is that in resus ˈriˌsəs the second vowel is strong and carries secondary stress, while in rhesus ˈrisəs the second vowel is weak (and can't carry stress). The use of schwa with stress in the screenshot above is just the OED's way of representing the US realisation of the STRUT vowel. I think it's a bit confusing really. I see that hum versus the interjection possibly spelt h'm is suggested here as another STRUT-schwa minimal pair (for RP, at least), so I looked to see what the OED did with it. An inarticulate exclamation uttered with the lips closed, either in a pause of hesitation or embarrassment, or as expressing slight dissatisfaction, dissent, etc. Their definition ("lips closed") does rather suggest a transcription /hm/ rather than /həm/, doesn't it? ɪnsɪdentli, ɪn keɪs ɪts juːsfʊl, dʒʌs tə let juː nəʊ ðət ɔːl juː keɪ rezɪdənts kən get friː ɒnlaɪn ækses tə ði əʊ iː diː. guːgl fə "ɒksfədʃə refrəns ɒnlaɪn" ən "dʒɔɪn ɒksfədʃə laɪbrəriːz" (ɪn ɔːθɒgrəfi, ɒbvjəsli). aɪm raɪtɪŋ ðɪs ɪn aɪ piː eɪ əz aɪ dəʊnt wɒnt tu ædvətaɪz ɪt tuː waɪdli - ðe mʌni kliəli hæz tə kʌm frəm sʌmweə, neɪmli maɪ kaʊnsɪl tæks! Never heard of it, either in the first 20-odd years of my life that I spent in England, or the last 15 years in the US. This suggests that it could be a recent coinage that is restricted to Britain. Or that I don't watch enough medical TV dramas. If I were coining a two-syllable clipping of "resuscitation" it would have second-syllable stress. Does the first-syllable stress suggest it originated in the compound "resus room"? Consider ˈri: ̩hæb also abbreviated from a noun. And consider the nouns from transitive verbs ˈri: ̩rɑɪt, ˈri: ̩rʌn, ˈri: ̩̩teɪk, ˈri: ̩meɪk, ˈri: ̩kɔ:l ˈri: ̩hæʃ etc. Rehabilitation, though, has a different stress pattern than resuscitation so it's not fully parallel. The full words may not be parallel but there is a uniform stress pattern for many re+SYLLABLE words when the SYLLABLE is a fragment or a noun conversion of a monosyllabic verb. I can think of re- words with stress on the second syllable as Joe Stynes suggested, but none are nouns — let alone nouns with the structure described above. I'm amazed at the OED's /rᵻˈvəːb/ U.S. /rəˈvərb/. I've never heard it, and if ever a student of mine had said it I would have called it a mistake. You may well be right about vowel length. I do say rɪˈkɔ:l for the noun recall. However, this is limited to the noun that means 'recollection'. The noun that means 'summoning back' is (for me) ˈri: ̩kɔ:l.
And, with a different prefix, consider ˈpri: ̩fæb, ˈpri: ̩mɛd. @Alan: it's /hʌm/ in the OED because it hasn't got round to that section of the dictionary. It's obviously worked on the r entries, because we've got, for 'run', Brit. /rʌn/ , U.S. /rən/ whereas for 'bun' we've only got /bʌn/. I'm sure vp is right in that they just 'translating' it into a US-style IPA, and leaving out length marks, as in the entry for the noun 'reject': Brit. /ˈriːdʒɛkt/ , U.S. /ˈriˌdʒɛk(t)/.